Almost every running system generates some type of event log to record information, warning, error, alarm, and failure messages. Many of these systems record their events in a relational or SQL-based database. When an error or disruption occurs you can usually find event records in the database with details of the problem but this is often done after the fact. A better solution would be to monitor and filter the event records as they are written and to notify upon specific types of events. How is TopView for SQL Events different than TopView SQL Lookup? TopView SQL Lookup is designed for table lookup queries. For example: if you have a database table of tags, values, and timestamps, TopView SQL Lookup can be used to monitor the values in the table. TopView for SQL Events is designed to monitor and filter event logs written to SQL databases. TopView for SQL Events support SELECT statements and Stored Procedures. TopView for SQL Events communicates to your database using ODBC. ODBC provides a standard interface for querying data from relational databases regardless of database vendor. Some ODBC drivers also support spreadsheets and files as the data source. 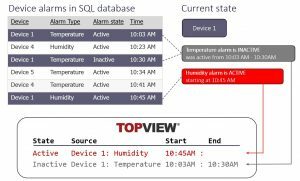 TopView for SQL Events provides a transparent layer between each event log and the event sources that will be monitored by the TopView Alarm and Notification Engine. 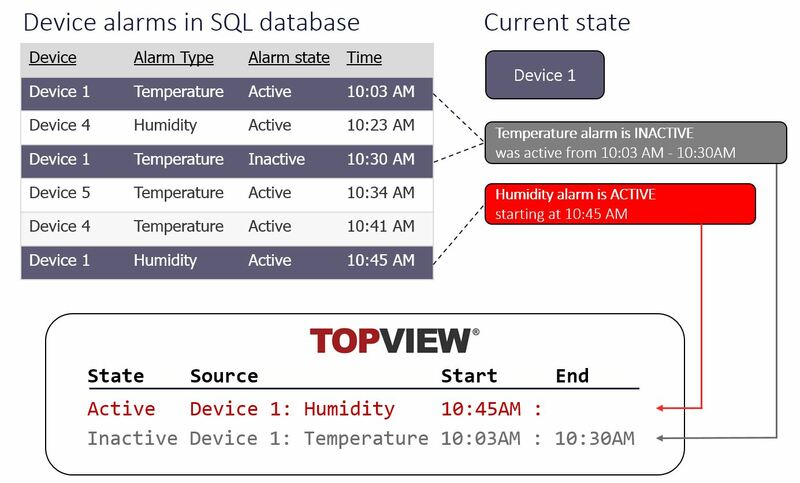 This example uses a SQL database that tracks temperature and humidity alarms from 10 devices. In our example database (below) the newest events are at the bottom of the table. By examining the event records we can determine the current state of each device and alarm type. For example, looking at Device 1 events, we can see that there was a recent temperature alarm from 10:03 until 10:30. Also a humidity alarm went active at 10:45 and is still active. We now have the current state of the temperature and humidity alarms for device 1 and we could repeat this analysis for the other 9 devices to determine current alarm state. This process is what happens in TopView for SQL Events – it continuously monitors the database for new events and tracks the current state of each event type. TopView then lets you monitor current state, log and analyze state changes, and send notification for specific state changes.